If you have more than 70 flowering plants or more than 1,000 square feet, please fill out this form and one of our specialists will get in touch with you. Thank you! • All incoming plant material should be dipped in a solution of horticultural or botanical oil followed by a spray application 3 days later. • If incoming material is rooted, submerge rooted area in approved mycoinsecticide for controlling aphids according to label rate. • Reject or quarantine any incoming material with active infestations of pests or diseases. 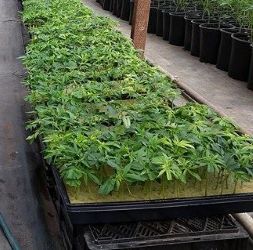 • Higher humidity in propagation can cause higher levels of fungus gnat pressure, release of Biological Control Agents (BCAs) as soon as possible is critical to prevent establishment of fungus gnats. • Smaller areas and smaller plants = Lower release rates. • Releasing BCAs at this time helps establish predators in the plants from the start of growth. • Bridging of canopies begins in this stage, making releases easier as BCAs can travel from plant to plant. • Slow release sachets of predatory mites are suggested at this point as plants should be sturdy enough to support them. • Release rates increase as plants grow larger and foliage begins producing heavy leaf hairs and trichomes. • During this stage it is still optional to use approved and compatible pesticides. • “Over the top” applications of bulk predators are still an option. • This is most critical stage for controlling pest pressure as spray options become more limited due to persistence of pesticides in final product, denser canopies which gives you less spray coverage. Humidity spikes can also lead to mold or mildew (especially indoors). • “Over the top” applications are not suggested at this stage due to the potential for vermiculite or bran carrier sticking to the flower; utilize Universal Release Boxes (URBs) to release predators within the canopy, avoiding any contact with developing flowers. • Larger plants; more leaf hairs; heavy trichome production; zero tolerance for pest damage at critical stage = higher release rates. 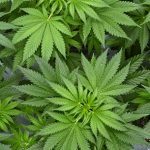 • Despite common misinformation on the net or cannabis publications, there is no scientific evidence that supports using BCAs for root-feeding aphids. Approved mycoinsecticides labelled for aphids applied to root zone is the best curative approach. • The WFT completes the pupal life stages below soil/media = mix of BCAs needed to break life cycle. 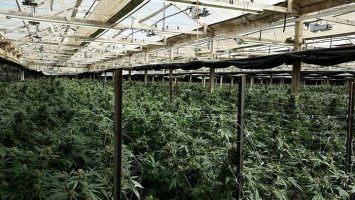 Due to the varied growing styles and growing spaces of cannabis, release rates will vary based on many factors (stage of growth of plants, level of infestation, time until harvest and many more). Additionally, factors such as high/low temperature and humidity may affect which BCA is suggested for a specific situation. Consult an IPM specialist for release rates and suggestions on which BCAs will best suit your needs!